Hoophouse Phase 7: planting and mulching and watering–at last! I participated in the Ultimate Blog Challenge through the month of July. It was a big deal for me, maybe not the smartest decision that I’ve ever made, but I wouldn’t let myself quit, once I realized that perhaps I’d not thought this thing through. To do the UBC properly, you post a brand-new post every day and share it with your friends and blogging buddies, and then you read and comment on other bloggers’ posts. I’ve done this challenge three times now: once in January, once in April, and now this time in July. July was, by far, the hardest for me. In the summertime, you see, I have this little quirk. Some might call it an obsession. Or a compulsion. Or a demented mental condition. To wit: when the sun is up (and sometimes, when it’s not) I want to be outside, in the worst way. I want to eat outside. Cook outside. Work outside. Play . . . outside. BE OUTSIDE. Sights like this, you see, can only be seen OUTSIDE. I remind myself of my little sweet brother, Matthew. I can still see him, just a toddler, standing by the screen door in the summertime, his little fingertips hooked into the screen, pleading ” . . . ‘side. . . . ‘side? . . . ‘side!” That’s me. If I have to be inside for long, I begin to hang onto the screen door and murmur ” ‘side. . .!” until I can’t stand being inside any longer, and then I dash out there. To take the trash out, or to fetch the mail, or to check on the chickens or to pick the peaches or to grab some kohlrabi and kale out of the garden . . . to indulge myself in just a bit of weed-pulling . . . whaddya say? Do I have a problem? Sheesh. Now I wanna go outside. So the point is (is there a point, Amy??) that it was a bit brutal for me to get so much writing and blog-reading and commenting and posting done, when all I really wanted to do was to go outside for something. Water something. Pick something. Mulch . . . something. So I did all this inside activity very early in the morning, or in the afternoons when little Mack was doing his “rest hour,” and that worked pretty well, as long as I typed really, really fast, and ignored the windows. So on Thursday, August 1st, the Challenge over and completed, I kinda collapsed into a puddle from the effort and decided that I’d never look at my blog again. And then . . . by Friday . . . I started itching to take a few pictures. And I thought of something I wanted to share with you, my Gentle Readers. And I started to recover, and to grow a bit curious about what was going on in the blogging world . . and now it’s Saturday . . . and here I sit (little Mack is running errands with his dad, so the house is quiet for that elusive nanosecond that is always unsettling, yet euphoric) with my mind bubbling over with ideas for blog posts and topics that I want to learn more about, before I go back outside. Blogging really is fun, but remind me next year not to do the blog challenge during the month of July, won’t you? So this week has been a busy one, with peaches and apples from the orchard to take care of, tomatoes finally ripening, and taking the old hens and the Cornish Cross chickens to the butcher. And . . . planting and mulching and watering in the hoophouse!! (Generally I eshew using multiple exclamation points as being only fit for notes among the ‘tween set, but if you only knew how long I’ve been waiting for the chance to plant seeds and seedlings into that hoophouse . . . !!) Bryan worked very hard to install a better watering system than I deserve, a ’14 Cadillac system, as it were, when a ’52 Chevy system would suit me just fine. Bryan walked around the house for days, muttering enigmatically about watering systems and hoses and spigots and PVC vs. metal pipes, and so on, while I busied myself with dragging a too-long hose out to the hoophouse and using it and a broken old sprinkler to water the seedlings that I was putting in. Here’s a prime example of why we need each other. Bryan shows me that there is, indeed, a better way to water than using a clumsy, 500-foot hose and a broken sprinkler. . . and I make do with what we have as long as possible. . . thereby allowing Bryan to design and build this nifty watering system for me. Does that make sense? 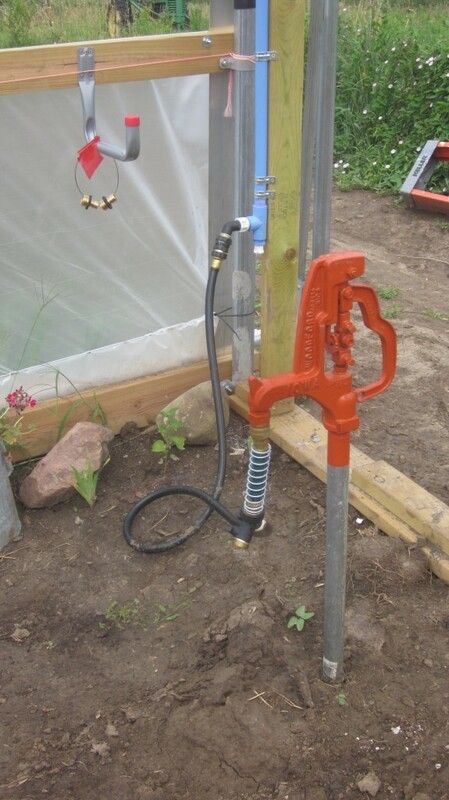 As you can see from the photo above, Bryan has attached a short black hose to the hydrant (with a nifty hose divider, too) and this hose connects to the PVC system that runs up the corner of the hoophouse to the top and center of the structure. In a nod to one of my favorite colors, Bryan painted it all a very pretty blue. The paint will (hopefully) slow down the degradation of the PVC in the intense sunlight at the top of the hoophouse. 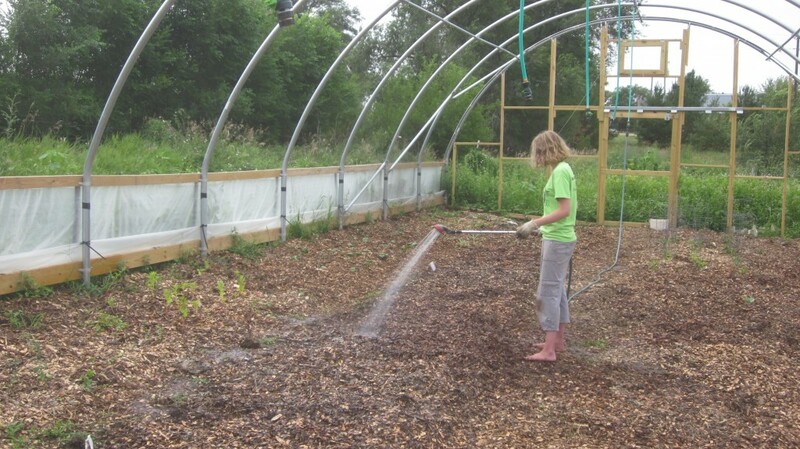 Here’s Amalia using the brand-new watering system. There will be a dripline system laid out on the floor of the hoophouse (next week, hopefully?) but the system that comes down from the ceiling will be handy for spot-watering of new plantings and little seedlings. That’s precisely what Amalia is doing. Bryan ran the PVC pipe along the top of the hoophouse, and attached five (see how he loves me–and lots of little connectors and hose fittings) short hoses to the PVC, so I could easily and quickly water from any area of the hoophouse, without having to drag a clumsy, heavy hose around. Our newest kitten, Samwise, spent the morning in the hoophouse with us. 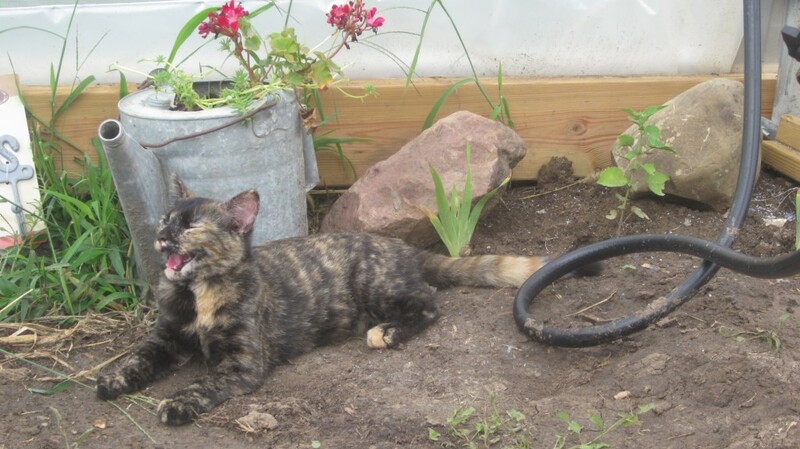 It was her very first time to run about freely outside, and it was such fun to see her tumble around, chase and leap after insects, and react to the outside world with such curiosity and delight. I think Sammy and I are kindred spirits. While Sammy dashed and jumped and explored and took an occasional break to pant (in the photo above), little Mack did a little spot-watering for me, Timothy hauled woodchips, and Amalia laid down layers of newspaper and moved chips around for me. 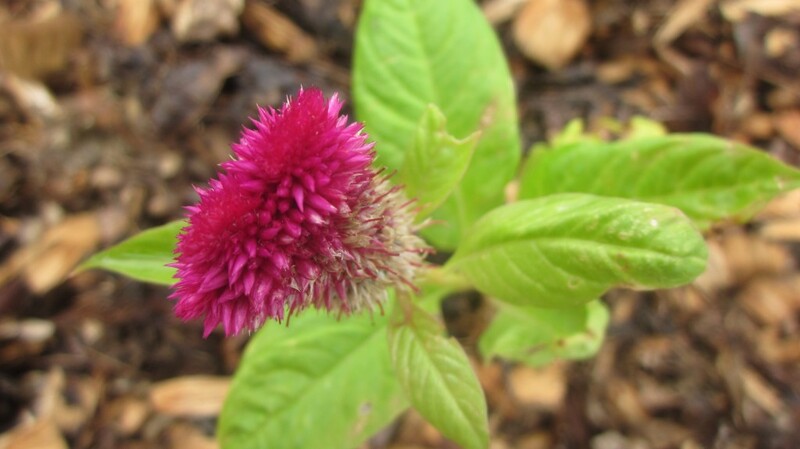 I planted and fussed over my seedlings and pulled up the bindweed that is already worming its way into my lovely new garden, darn it. 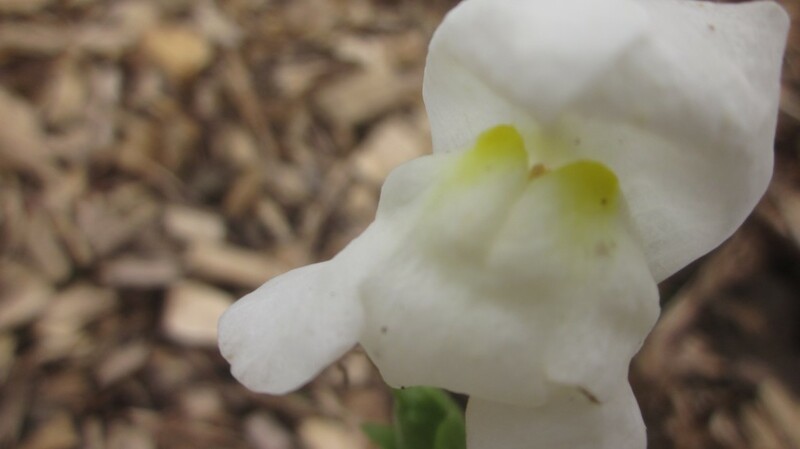 This creamy white snapdragon looks quite content in the hoophouse bed. In this way, in just a few hours the four of us had the hoophouse planted and I honestly didn’t want to leave when we were done. I don’t have my hammock hung in the southeastern corner yet, or I might have just curled up for a reading break right then and there, after releasing the kids to their own plans. These pak choi plants look very cozy and snug, do they not? 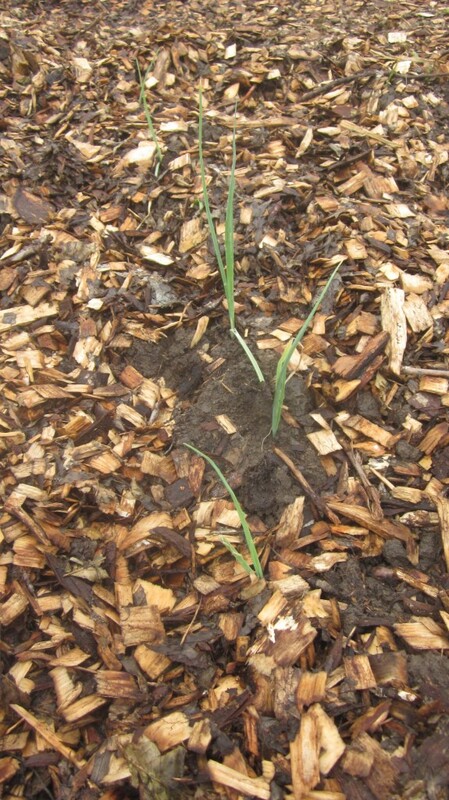 And here are some baby leek plants . . . I applaud these brave little shoots. They’ve been in flats all summer long, just waiting for the hoophouse to be plant-ready. They ought to be quite hardy! I’ve saved some space for radishes and lettuces, which I’ll plant in the next week or so. I’m excited! Soon all these infant veggies will be under cover, and they’ll sail past our first frost in October, and even past (perhaps) a freeze or two. While all the rest of the gardens will freeze, I’ll still have lots to choose from in the hoophouse. It will be grand. This has been a big project spanning several months, involving the help and comfort of lots of good folks. If I’ve piqued your curiosity about how it all went up, again you can start the tale right here. I’ll keep you posted . . . the next photos I share should involve the plastic going over the top (now that’s going to be an exciting day) and plenty of growth inside! This coleus seems very happy, too. Thanks for taking the time to read, as always, Gentle Reader. I do appreciate you! Now . . . I think I’m gonna go outside. . . I think my hoophouse plantings might need a little water . . . so until next time . 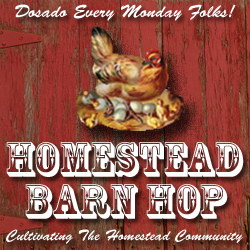 . .
Every Monday I try to jump in to the fun event at one of my favorite websites, The Prairie Homestead, called the Homestead Barn Hop. Join me! I’ve missed seeing your posts, Cher! I’ll look forward to reading more from you this month! My kids love being outdoors. As soon as my 3 year old wakes up, he wants to be outside. Cannot wait to see more on the food! It looks like you have put a lot of work in to it! I’m thinking you need a laptop in the hh! I love your adventurous spirit in doing everything you can outdoors. 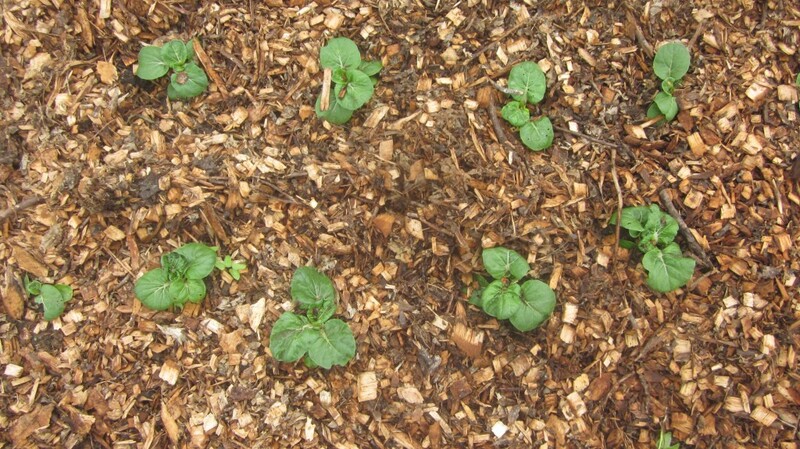 The seedlings look s very comfy, nestled into the bark chips like that. I bet they’ll love the environment. The watering system looks awesome. Here’s to a wonderful growing cycle. Don’t give up, Susie! Hang in there and try something new next year! (See my comment on your blog post for more specifics.) Courage, my friend, a good garden is definitely worth the effort! So what have you got against brussle sprouts, perhaps one of my favorites. I am happy to see you have almost completed your mission. I fell off the UBC towards the end, when everything started happening with our projected trip. The trip starts in 5 weeks, yaaa. Only tough part is I’m the drive for all 2800 miles.. I will get there just in time to start planting for the Mexican summer and plan to try my hand at eggplant and brussel sprouts as well as kale, parsnips and turnips, plus sweet corn. That’s about all I’ll tackle the first season because we will be building our house at the same time. We can exchange pictures of your winter crop and my Mexican Summer crop on the next UBC. And get yourself a laptop for sure. Writing from the garden can be great fun. NICE job on the water system – right down to the clamps on the 2″x4″! 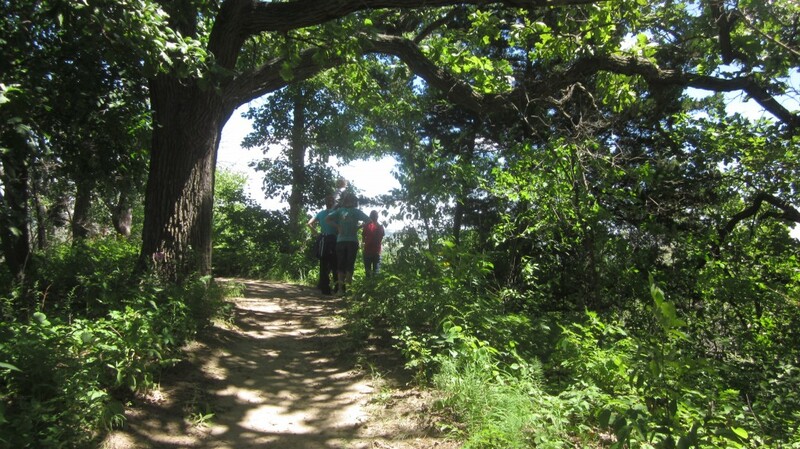 And I’m with you – being outside is great. If only the laptop didn’t get such a glare on it I’d even do more outside! Alessa, I’m afraid that I’d be too distracted by the birds and the flowers and the breeze and . . . I never thought I would say the words ‘hoop-house envy’ It looks magnificent, I am starting out on a project in our ‘little piece of heaven’ tomorrow and over the weekend.